^ a b c "Health Profile: Guinea" Archived 13 November 2008 at the Wayback Machine. USAID (March 2005). This article incorporates text from this source, which is in the public domain. Politics of Guinea takes place in a framework of a presidential representative democratic republic, whereby the President of Guinea is both head of state and head of government of Guinea. Executive power is exercised by the government. Legislative power is vested in both the government and the National Assembly. 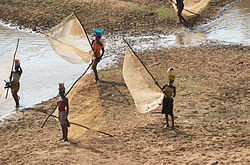 Transport in Guinea is composed by a variety of systems that people in the country use to get around as well as to and from domestic and international destinations. The Republic of Guinea Armed Forces are the armed forces of Guinea. They are responsible for the territorial security of Guinea's border and the defence of the country against external attack and aggression. Conakry is the capital and largest city of Guinea. A port city, it serves as the economic, financial and cultural centre of Guinea. Its population as of the 2014 Guinea census was 1,660,973 Originally situated on Tombo Island, one of the Îles de Los, it has since spread up the neighboring Kaloum Peninsula. Ahmed Sékou Touré was a Guinean political leader who was the first President of Guinea, serving from 1958 until his death in 1984. 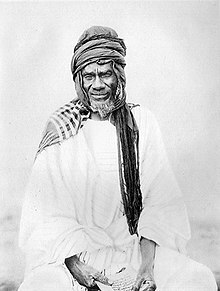 Touré was among the primary Guinean nationalists involved in gaining independence of the country from France. Lansana Conté was the second President of Guinea, serving from 3 April 1984 until his death in December 2008. He was a Muslim and a member of the Susu ethnic group. Rio Tinto is an Anglo-Australian multinational and one of the world's largest metals and mining corporations. The company was founded in 1873, when a multinational consortium of investors purchased a mine complex on the Rio Tinto, in Huelva, Spain, from the Spanish government. Since then, the company has grown through a long series of mergers and acquisitions to place itself among the world leaders in the production of many commodities, including aluminium, iron ore, copper, uranium, and diamonds. Although primarily focused on extraction of minerals, Rio Tinto also has significant operations in refining, particularly for refining bauxite and iron ore. The company has operations on six continents, but is mainly concentrated in Australia and Canada, and owns its mining operations through a complex web of wholly and partly owned subsidiaries. Rio Tinto has joint head offices in London and Melbourne. Alpha Condé is a Guinean politician who has been President of Guinea since December 2010. He spent decades in opposition to a succession of regimes in Guinea, unsuccessfully running against President Lansana Conté in the 1993 and 1998 presidential elections and leading the Rally of the Guinean People (RPG), an opposition party. 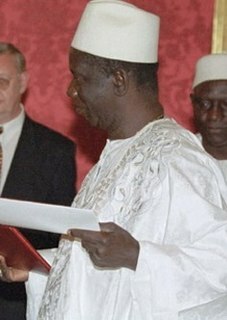 Standing again in the 2010 presidential election, Condé was elected as President of Guinea in a second round of voting. When he took office that December, he became the first freely elected president in the country's history. Condé was reelected in 2015 with almost 58 percent of the vote. Simandou is a 110 km long range of hills located in Calmonz and Kankan regions of southeastern Guinea, in the country's mountainous, forested Guinée Forestière region. At the southern end of the range the site of a large iron ore deposit is currently being developed. Camp Boiro or Camp Mamadou Boiro is a defunct Guinean concentration camp within Conakry city. During the regime of President Ahmed Sékou Touré, thousands of political opponents were imprisoned at the camp. It has been estimated that almost 5,000 people were executed or died from torture or starvation at the camp. According to other estimates, the number of victims was ten times higher: 50,000. Guinea has 1,086 km of railways. This includes 279 km at 1,435 mm gauge and 807 km at 1,000 mm gauge. The latter includes 662 km in common carrier service from Kankan to Conakry. Presidential elections were held in Guinea on 11 October 2015. The result was a first-round victory for incumbent President Alpha Condé, who received 58% of the vote. The mining industry of Guinea was developed during colonial rule. The minerals extracted consisted of iron, gold, diamond, and bauxite. Guinea ranks first in the world in bauxite reserves and 6th in the extraction of high-grade bauxite, the aluminium ore. The mining industry and exports of mining products accounted for 17% of Guinea’s gross domestic product (GDP) in 2010. Mining accounts for over 50% of its exports. The country accounts for 94% of Africa’s mining production of bauxite. The large mineral reserve, which has mostly remained untapped, is of immense interest for international firms. The international relations between Guinea and India have been cordial and friendly. India maintained an embassy in Conakry, but shut it down after more than 2 decades of operation in 1988. Subsequently, the Embassy of India in Abidjan, Côte d'Ivoire was jointly accredited to Guinea. Guinea opened its embassy in New Delhi in April 2012. India has maintained an honorary consul in Guinea since 1989.